Through numerous examples, this guide illustrates how you and your managers can work together to combine and implement systems technology with just-in-time and just-enough-learning strategies. Plus, you'll get a comprehensive checklist for conducting an organizational training audit and getting started. Use this guide to get your organization's systems on track today! ROBERT O. BRINKERHOFF is professor of educational leadership, Western Michigan University, and an internationally recognized human resource development consultant to numerous organizations worldwide including the U.S. Postal Service, Apple Computer, and The World Bank. He is author of Achieving Results From Training (Jossey-Bass, 1987). STEPHEN J. GILL is an indepAndent consultant on training needs analysis and evaluation. His clients include Ford Motor Company, General Motors, Steelcase, and Columbia Healthcare. 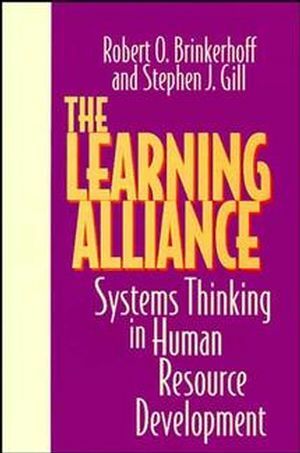 Beyond the Classroom: A Systems Approach to Organizational Learning. Facilitating the Learning Process: New Roles for Trainers. Barriers to Learning: Training Myths That Get in the Way. Impact Mapping: Creating a Shared Vision Among Stakeholders. Getting to the Heart of the Business: Principles for Highly Effective Training. Linking Training to Business Goals. Using Systems Thinking to Integrate Work and Learning. Using Measurement and Feedback for Continuous Improvement.